The first time I ever saw Cheltenham Town play was a Southern League Cup match at Minehead in August 1976. In none of the 658 matches I have seen the club play since then have I seen a starting XI for the first team that did not feature at least one player I had seen play for the club before. I cannot make it to Lincoln on Saturday, but if we field the expected team there, and then do not change it for the home game, this should change in the next week. I am not worried by the fact this is a completely new team. The team we had last season played so poorly, and were so demoralised that even those who can play a bit were not showing it in our colours, and they will be better off elsewhere. I have not bothered much with reading the interviews as the new players come on board. Any player can say how much he wants to be part of the squad and is really pleased to be here. The succession of signings last season all gave a good initial interview. Many did not then follow this up on the field. “Obviously”, a player is not going to say in the interview that he is joining our club, because he could not get a better offer elsewhere – but in most cases that is really the case. So now, on the day before we start in earnest, if the boy can play quietly for a couple of hours I will look over who we have signed, and where they have come from. (I am using soccerway as the primary source of stats – it is not 100% accurate, but other sites tend to use the same sources). Dillon Phillips (age 20). Goalkeeper on loan from Charlton Athletic with a six month agreement. Phillips has had loans in the division below us with Bishops Stortford and Whitehawk. He has also been on the bench a few times for Charlton without playing in the league. Jack Barthram (21). Barthram has made starts, and ten substitute appearances for Swindon. He was a non-playing sub for the visit to Cheltenham last season. George McLennan (19). McLennan made three appearances for Scotland U-19in May last year. He has been released by Reading without ever making the bench for them. He played a few games last season on loan for Hayes and Yeading. That again is one step below our status. Kyle Storer (28). Storer has a lot of experience at this level, mainly with Kidderminster, before switching during the last transfer window to Wrexham. He has played in friendlies against Cheltenham, but is a new face to me. Aaron Downes (30). At thirty years of age, Downes is the senior member of the squad. The Aussie played for Chesterfield from 2004 to 2012, and then switched to Torquay United. He also had a short spell at Bristol Rovers on loan. Downes has played against Cheltenham in the league for all three of Chesterfield, Bristol Rovers and Torquay United, but not (as suggested by our official site) in the 2012 play-off semi-finals. He was a Chesterfield player at that point. Daniel Parslow (29). The Welshman started with Cardiff, but has spent most of his professional career with York City. In 2012 he played in both the Trophy final and the play-off final for York City, a notable double as York won both. He played at Whaddon Road for York in November 2012. Parslow spent most of last season on loan at Grimsby, and came on as a substitute in the Play-off final. Harry Pell (24). For someone who has not reached his 25th birthday, Pell has played for quite a few clubs, with football league appearances for Bristol Rovers, Hereford United and AFC Wimbledon, Conference for Cambridge United, Hereford United and Eastleigh. Pell played twice for Hereford at Whaddon Road in 2011, and then in both games of the 2012 FA Cup encounter, before coming to Whaddon Road twice more for AFC Wimbledon. Pell spent a month last season on loan at Grimsby, then transferred in January to Eastleigh, playing against Grimsby in the play-off semis. Daniel Wright (30). Wright knows his way around this league, with 83 goals at this level in just under 300 appearances. Wright has played for Histon, Cambridge United, Wrexham and Gateshead before moving to Kidderminster last January. Amari Morgan-Smith (26). Morgan-Smith is expected to be the strike partner for Wright, and our season may depend on how this works out. Amari made his football league debut by coming on as substitute for Stockport in the final game of the 2007-8 season. On his release, he signed for Ilkeston Town, moving onto Luton in September 2010. He was with Luton when we played them in the FA Cup in 2011, but missed the game, (and most of the rest of the season, having been a regular before hand). He then moved on the play for Macclesfield and Kidderminster. His career took a jump last summer, and his second football league appearance, (again coming on as sub) was for Oldham Athletic at the start of last season. He played 13 times in the league last season, but made only three starts, and scored twice. There were also appearances in the Football League Trophy (starting) and the FA Cup (last minute sub). Jack Munns (21). The youngster started at the Tottenham academy, then spent time with Aldershot and Charlton – for both clubs he has been an unplayed substitute in the football league, but he still has to make his senior debut. This is likely to be the starting line-up at Lincoln. I would say it is a good mixture of younger and older players. Still, I would say that if Gary Johnson has managed to find the right mix first time out with eleven new players, he is a footballing genius. We will have to wait to see how it develops, and with seven games to play in August, we will get a feeling for that very quickly. Johnson has been disappointed in a couple of his attempts to bolster the squad. We know about JJ Hooper agreeing to sign, but then wanting to talk over another club’s offer. We saw that Johnson stamped on this very quickly. He has also been attempting to add another loan player who still has not turned up. We have more new signings, of course, although two of these have been loaned out. Calum Kitscha (22). Calum has been playing at one level below the National league with Histon, and then Hayes and Yeading. He has managed to get selected into the England ‘C’ squad (the non-league team) despite this. It would not surprise me if we made him our first choice goalkeeper during the winter and allowed Phillips to return to his club, especially as we also have a third goalkeeper,. Rhys Lovett (not squad number) (out on loan at Tiverton) who can be recalled. Adam Page comes in from our youth team, and having signed a professional contract, he has gone out on loan to Midland League newboys, Hereford FC. James Rowe (23). Rowe was a substitute (replacing Eliot Richards) when Cheltenham Town won at Tranmere early last season. He was released by Tranmere in January, and had previously played for Forest Green. As Johnson has tried to sign two more, it seems possible that we still have additional names to name – meanwhile we have almost have a team out on loan. As well as Lovett and Page, Zack Kotwica, Harry Williams, Bobbie Dale, Jack Deaman, Omari Sterling-James and Jamal Lawrence are all away at the moment. The latter three were transfer listed along with Lee Vaughan. We also had three players “to be assessed”. Of these, Asa Hall may well be on the bench tomorrow, but Jordan Wynter is apparently not fit, while it will be a while before we can properly rate Eliot Richards again. It seems that James Rowe, Asa Hall, Joe Hanks and James Bowen have to be on the bench, as we may have only sixteen fit players actually at the club. However, two of the players are heading to Farnborough who will not play for at least two Saturday as the club’s status remains to be confirmed and a c.v.a has still to be agreed. Hence, Dale and Williams are available to join the squad at Lincoln. It is all very well and good that everyone at the club feels confident that we can bounce back, and return to the Football League in one go, as Bristol Rovers have done. However, it is by no means cut and dry, there are at least three teams with resources from significantly better crowds (Grimsby, Tranmere and Wrexham), and two who seem to have a fantastic level of support from benefactors (Eastleigh, Forest Green). Of these five, most bookmakers offer shorter odds for the title on all but Wrexham. Let’s start with what we know. We are half way through the season, with a points tally of 25 points from 23 games. We are placed 19th out of 24 teams, only three points better off than Dagenham & Redbridge, who are in the drop zone. Hartlepool may be somewhat further adrift, but they are not in an unrecoverable position. If we can double our points tally to 50 by then end of the season, we will probably (but not certainly) finish above the drop zone. Only a point or two more than that takes us well into the comfort zone. If we do not reach the 50 point mark for the season, then we are going to be in trouble to the last day – drop down to 46 and we can expect to play Conference next season. Going beyond the points total, to the trends, and things look worse – we had a tremendous start to the season, unbeaten in the first six league games, with 14 of our points to date coming in those games. Any attempt to extrapolate to the end of the season based on stats that ignore those games leads only to one conclusion, and the five league (and one cup game) since Paul Buckle has taken over has not helped this – three draws and three defeats. So results have not improved under new management, but the winds of change are clear for anyone to see. I do not know of anyone among the regular support who does not believe we are now playing better than we were in the last couple of months under Yates, (discounting the Swindon result as being an aberration during this period). Experienced players have found their position in the team under threat. Jason Taylor was dropped completely from the squad, and sent away to Northampton as soon as there was a chance to offload him. Byron Harrison has been dropped to the bench, and despite being our leading scoring this season and last, he has not taken to the field in the last two games even though we have lost both. Instead it is the youngsters who have come in – Omari Sterling-James, Zack Kotwica, Joe Hanks and Harry Williams have all been given a chance to shine and new or extended contracts meaning, they are all now committed to being with us next season. The other young professionals in the squad may feel that they have more of a chance now as well. Players have also seen they need to show commitment to get on here. If I am to believe rumours I have heard, Raffaele de Vita was offered a fresh contract as well, but having not grasped in with both hands, found that it was not still there. I have also heard that Buckle demands much more than Yates during training, and not just from each player on their own account, he also expects the senior players to help the younger ones in improving their game. Whether this has counted against players such as Harrison and Jason Taylor is however no more than speculation by those passing on the rumours. So far, our manager has guarded against revealing such insights. He is too professional for that. On the first day of the year, we have a surprising amount of transfer activity – with the departure of Jason Taylor, and three young Liverpool players coming in. Kevin Stewart appears to be the most experienced of the trio. He has been on the bench for Tottenham in three Europa League games, and has started four times on loan for Crewe Alexandra. Lloyd Jones has apparently been on the bench for Liverpool in one Premier League game, at Fulham in May 2013 – but has yet to make his first team debut. He has played for both England and Wales at under-19 level (if Soccerway is accurate on this) and for Wales U-17, (born in Plymouth). Jack Dunn has also played for England’s younger age teams, I have even seen him briefly in action when he came on as a substitute for an England U-19 side at Preston in May 2012. (As it happens, Luke Garbutt was originally selected in the same squad, but withdrew to play for us in the play off final at Wembley. All three of our new players already had squad numbers at Liverpool (41-Dunn, 51-Jones, 55-Stewart). The result of these signings is that our already young squad is getting even younger. I would not be at all surprised if someone calculated this as the youngest ever team we have fielded – especially as the two oldest players at the club, Elliott (36) and Matt Taylor (32) are both missing through injury. The fact that all the changes today have been loans is generally forced as full transfers cannot be registered until Saturday morning. I thought they could play on Saturday (with the exception of teams who are playing in the FA Cup, who can only use players registered by lunchtime Friday). As such, it is less than clear whether Jason Taylor has left for good, or if this is a short or long term loan. The first tweet from the club said he was “leaving on a permanent basis”, but the news report later referred to it as a loan. The Liverpool trio have all signed on loan forms with an initial one month period. With the exception of Kevin Stewart, these can be youth loans, which would allow the players to spend all of the half season with us, while still having the flexibility to return to Liverpool on demand. They can even play some non-first team games, or attend training at Liverpool and then return to us afterwards. Stewart is too old to be on a youth loan, so is either limited to 93 days, or needs to sign a longer deal before the transfer window closes. I would expect all three of our new faces to be in the 18 on Saturday, but I cannot even speculate over who will start and who will be on the bench. I doubt if Paul Buckle himself knew the answer to this before the first training session today. It will also be interesting to see where this leaves those youngsters promoted into the squad in the last few games, and of course where all this leaves the other players whose future has been questioned. As Williams was preferred to Harrison last week, will Harrison be dropped from the 18 this time? While the sudden throughput in players, which may well not be terminating this week – the window runs to the first Monday in February after all, this is certainly an interesting time to be a Cheltenham fan – and I do not mean this in the way of the (fictional) Chinese curse. We have no choice but to wait and see what the team looks like on Saturday, and by the end of the month, it could well change significantly again. I admit to having some worry over loan signings. Our support has shown itself to be a little uncertain about loans, especially when they play a few games and then return to their clubs. It is true that some of the loan players have not been up to the task, or did not appear to put their heart into playing for Cheltenham. However, some of the more successful loans, (such as Garbutt and Butland) have made such an impression that they have been followed by our fans as their careers develop. My worry also harks back to those six good games at the start of the season. Our early season form owed something at least to loan players Koby Arthur and Jordan Wynter and I felt that we never found adequate replacements when they were recalled by their clubs. This was at least a contribution to Yates’ departure in November. Let us hope that Buckle has made agreements that suit us as much as they suit Liverpool in bringing these players on board. When the change came, it was quick. It is easy to guess how the process went, even if at least one press statement (given b Paul Baker on Monday) confused the issues. Those members of the board that were at last Saturday’s game will almost certainly have decided there and then that things were not right, and at least considered at that point that it was time to change. I believe most of the board attend most of the home games, so discussion will have been occurring straight away. If you decide to change manager in mid-season, there are two basic ways to go about it – either you sack the incumbent, appoint a caretaker and then open up the position for applications, or you quietly approach someone and have an basic agreement in place before the sacking. There is a slightly confused variant of this, when the chosen replacement is working for another club – as you cannot formerly approach a club while your old manager is still in place, as any leak would make his position untenable. In the past, Cheltenham have taken all available approaches. After bringing us into the league, and winning promotion to the third tier, Steve Cotterill left at the end of the season, giving the club plenty of time. They went for the option referred to be many as “cheap”, appointing Graham Allner who was already on the coaching staff. Allner was given the very difficult job of keeping the team at their highest ever level, but did not have the playing staff to achieve this. I was never one of the anti-Allner brigade, and would happily have kept him through the season, even if it ended in relegation. Considering criticism of later managers, he did at least try to have us playing in expansive, entertaining style that mirrored his successes in non-League football without mirroring the results. When Allner was sacked, we took several weeks contemplating his successor, ending with a short list that was heavily leaked, (not that I can now remember all the names). I do remember saying that while some candidates would be an interesting risk (was Luther Blissett interviewed? ), one was guaranteed to result in our relegation. Clearly my words were not heeded. We employed the one man I thought certain to lead us back to the fourth tier, Bobby Gould. I believe rumours that he was also a cheap option, having agreed to work to the end of his first season for free to be true. Even so, for his second season he had a contract. The Gould tenure was less than a year, and in the end he did not wait to be pushed. For this we should always be grateful, and I know that Gould is always welcomed back to visit the club. Having led us to relegation (that was expected anyway), the lack of improvement in the lower division was always going to account for him. With a resignation, you cannot have the new man in place directly. As I recall it, Gould left the club immediately after the home defeat by Rochdale on 18 October 2003. John Ward arrived just under three weeks later. Ward always had his critics. Even in his promotion winning season, some supporters were critical of dour defensive displays, and this did not improve after promotion. We reached our highest ever league position under Ward’s management while many complained about the football being dour. I personally always felt Ward was doing a good job, and I was hopeful that he could build the club and finally start brining youth players through the system and into the team. At the start of the 2007-8 season, results were worse and we looked as if we had gone backwards. Ward finally resigned in October, and many felt it was time, although I was disappointed as I thought things would pick up. As with the appointment of Allner, we took the option of promoting from within. Before Keith Downing took the reins, he had a month as caretaker. If a caretaker manager has a period of time to make his case irresistible to the directors, then Downing was a surprise choice. His five matches as caretaker involved two defeats and two draws, with the solitary win coming in the much maligned JPT Trophy game at Swindon. He was still appointed at the start of November and finally delivered a league win at the end of the month, (prior to which we had fell to Brighton at the Withdean in both the JPT Trophy and the FA Cup). However, the fact his first win was at home to Leeds United did remove some of the doubts about his ability. Without doubt, our best match under Downing was the tremendous 2-1 win at Leeds on a Tuesday night some months later. We eventually secured safety by beating Doncaster on the last day of the season. This result also consigned Doncaster to the play offs (they finished two points behind Nottingham Forest), although that displeasure would have been alleviated by beating Leeds United in the play off final. The first six matches of 2008-9 produced just one win and no draws, and on no less than four occasions we had four goals put past us. Downing’s sacking was practically inevitable, and came after a soggy Friday night in Hartlepool. Martin Allen was considered a favourite candidate by many supporters before Downing was appointed. This time there was no delay, and Allen was installed before the weekend was complete. The rest of the season was something of a roller coaster, before a final drop to relegation, while our squad always appeared to be on a carousel, with more comings and goings than ever seen before at the club. By the end of the season, the squad numbers of new players had to be defined by those numbers we could add to the shirts (I believe we run out of 2s and 4s). We had more loan players than it was permissible to play, and each newcomer was treated like a child’s fresh toy – great for the first days and then discarded for something else new and shiny. Allen assured us that some of the loan players were given free of charge. Others have assured me that this was either untrue, or did not include massively inflated expense payments. Eventually the board came to their senses, saw the bills and decided that we just could not afford the squad we had. So as the transfer window approached, we had to offload whoever we could to offset the expenses. It is worth noting that Lloyd Owusu was one of those who left and he scored seven goals for Brighton after departing. Had he scored those seven for us (in the right games), it is just conceivable that we could have avoided relegation. Although we won the opening game of 2009-10, we soon started to falter, and after thirteen league games, we had just three wins, compared to five defeats. Poor, but not disastrous, the results were combined with several disciplinary offences to put Allen on “gardening leave”. This led to a long and protracted exit, with John Schofield as caretaker manager for eight league, and one FA Cup match, with just one highlight, (5-1 at home to Barnet). Eventually, a compromise was reached where Allen left, and this left the way open for another popular choice. Mark Yates came in during December 2009, and did not make an immediate mark. We lost our first three home games under his management, while somehow being unbeaten in five away games over the period, (even if we only won once). The highlight was also away from home, the stunning 6-5 win at Burton, but home fans had at least one treat when Bury were disposed of by 5-2. The last trip of the season was a 5-0 defeat at Notts County, leaving us still vulnerable on the final day. We needed a point to be safe, but Grimsby needed three points and to make up a six goal deficit to condemn us to the Conference. In the end, we picked up our point, Grimsby lost 3-0 to go down while Barnet did overtake us on the last day to leave us 22nd in the table. The following season did not start badly, but ended up little better. We finished the season with thirteen wins and thirteen draws in the league, but only four of the wins game in the second half of the season. We finished five points clear of relegation, having basically secured our status with a win at Lincoln on Easter Monday. Lincoln went down with Stockport, we drew at Stockport on the final day. The poor second half of the season, and securing more points away from home were features of Yates’ time in charge. 2011-12 was, I felt, Yates’ best season. We got into the rhythm quickly, and were playing some really good football in the fall of 2011. We beat Tranmere and Luton, both away to set up a third round cup tie at Tottenham. However, Yates’ mid-season transfers do not seem the best in retrospect. If the playing strength was supposedly strengthened, the spirit of the team was not, and March in particular was unpleasant, without a win in seven games, and five on the trot without a goal. Still, we recovered and reached the play off final. The following season was a similar story – much better in the first half of the season than the second and play-off defeat, this time without the final itself. Having reached the play-offs twice, there was an expectation last season that we could do it again. This was never realised, and we ended the season with 55 points, five ahead of the relegation zone, although as this included losing the last two, we generally always had enough in reserve to be safe. Still, it was the away games that kept us in the league. We picked up 24 home points, and we had only picked up 24 away, this would not have seen us safe. It is also notable that only 21 of the 55 points came in the second half of the season. While I did not feel Yates’ should have been sacked during this run, I did not think he should get his contract renewed. The board decided just to change to second in charge from Howarth to North, and to give Yates another year. For a brief moment, it looked like a good decision. We picked up 13 points from 5 league games in August. It soon became clear we were flattering to deceive. Most of the flair on the field came from loan players Koby Arthur and Jordan Wynter, both recalled to their parent clubs, while the defence lost its solid appearance with the injury of Matt Taylor, (with him, our defeats tended to be by single goals, without him, 3-0, 5-1 and 4-1). Only nine points from the last 13 games, and precious little for the home fans – just nine goals in nine home league games. At times we have played really well, but these times are few and far between. I will see the Cambridge and Swindon games as highlights of the season, however we finish. If we are to repeat our habit of not doing as well in the second half of the season as the first, we would need to go the next five league games unbeaten to have the safety margin we need, (with three wins minimum). So come the end of the game, the board feel change is needed. I would imagine somewhere along the line, a quiet word with Shaun North comes up with the idea that Buckle is available, and of course that he would work with the existing staff. For those who do not know, Buckle worked with North at both Torquay and Bristol Rovers. It was not the most obvious of appointments, Buckle had moved to the United States with his wife, the sports presenter Rebecca Lowe. Reports say that he had a reasonable position as technical director of the Metropolitan Oval, a historic playing field which now acts as a USSF academy. International relationships are not easy (as I know from experience), so it comes as a surprise that he wants to return to UK management so soon. There was no popular choice on the supporters’ forums this time. The change came quickly and Buckle’s name appeared to be leaked quite soon into the process. The oddest part of the process was Paul Baker’s press statement on Monday, which did not show confidence in Yates, but appeared to say that he was in the last chance saloon, rather than about to be kicked out from it. It was a strange statement to make when Baker must have already started talking to Buckle. Would he not have been better keeping quiet for the day? Buckle’s record in the past suggest that he will not be a bad appointment. He has been successful at Torquay, and had a good spell at Luton. Still, the appointment has immediately caused some criticism. This seems mainly based on his short (and unsuccessful) period at Bristol Rovers. Choosing Cheltenham is not the easiest of choices to make. We are not the highest of profile of clubs, but a failure here will be close to a death knell for his hopes of a long football league career. By the same argument, it will be interesting to see if Yates’ career in management progresses. The 18 league games this season will not be an overall plus on his CV, and he may well have been better leaving during, or at least at the end of last season. I am more than hopeful that this appointment is at least a safe pair of hands, and that we can lose our fear of relegation. For this week only we get some idea as to whether Yates and his second in command saw eye to eye. I believe Yates would have kept to the 3-5-2 formation if possible, so if we start 4-4-2 or 4-5-1 then surely this is a difference due to North. It is almost a relief that the closing of the “emergency” loan window comes quickly, and there will be no new signings now. This gives the new manager a serious chance to review the squad he has inherited before making changes. We know that if can get the best out of the group we currently have, as Yates has managed on too few occasions this season (Bury, Tranmere, Cambridge, Swindon), then the players can deliver. This is Buckle’s first priority. Clubs change managers at this stage of the season, because anything is still possible, and that is the case at Cheltenham. Automatic promotion is not impossible, the play offs certainly within reach, but we are also nowhere near safe from the drop, and many games like last week’s would make this seem the greater possibility. Buckle is not starting with a blank canvass, but he still needs to make his mark, and to build confidence from the supporters, he needs to do it quickly. James always says I put too much detail into the blogs, so here is the quick summary for those who do not want to read much. 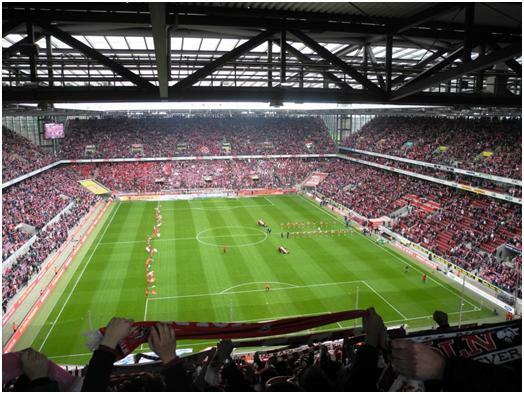 We went to Germany for a weekend of the three “B”s: Beer, Bratwurst and Bundesliga. Of the three, we took in more Beer than the others, but I shamed myself on the first day, and have now been named by James as “he who cannot organise a piss-up in two breweries”. The only way to avoid getting this on my gravestone will be to outlive James. 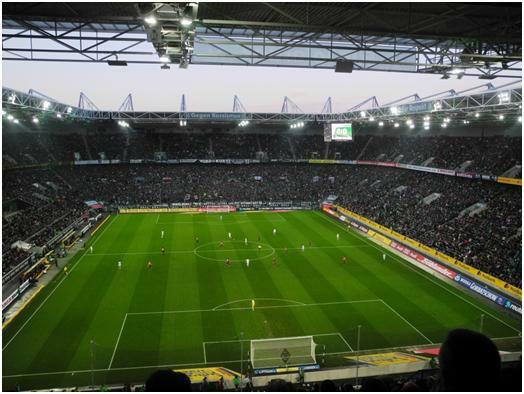 Football wise, we all saw the Bundesliga game Borussia Mönchengladbach v Hertha Berlin on Saturday, and the 2. Bundesliga matches, 1. 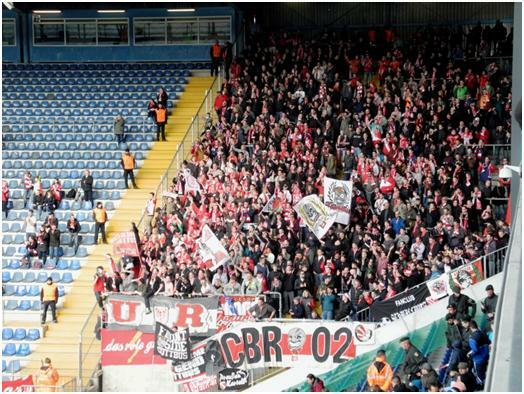 FC Koln v VfR Aalen earlier on Saturday, and Arminia Bielefeld v Energie Cottbus on Sunday. On the Friday, James and the Holder brothers went to VfL Bochum v SV Sandhausen, while I (looking for a new ground to visit) to the next town to see Borussia Dortmund II against Stuttgart Kickers at their old, Rote Erde Stadion. Some of the football was good, notably the first half at Mönchengladbach and the finish at Bielefeld, some less so, such as the game at Koln, and the second half at Mönchengladbach. The atmosphere at the stadiums is better than anything we get anywhere in England, and the admission prices are a long way lower than the home equivalents. 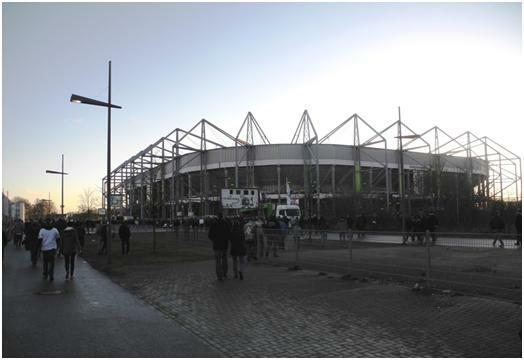 With Mönchengladbach having a new stadium (my second visit, though), and the Koln and Bielefeld grounds having been completely rebuilt since my last visit, the viewing at all these grounds was perfect. The beer was always good, even when I had to drink Kolsh or Lager instead of my preferred tipples. Deutsche Bundesbahn, combined with some local trams took as efficiently from place to place at more than reasonable prices. Most trains appear to run a few minutes late, but we always got where we wanted to be in time. The only downside to the travel was leaving Mönchengladbach, the only ground with no tram connection, where the disorganised shoving for a place on a shuttle bus took over an hour after the match ended. We met up at some ungodly hour at Birmingham Airport, where there was time for a Wetherspoons’ breakfast and a quick pint (to get into the theme of the weekend) before flying off to Dusseldorf. From there we picked up the regional day ticket for the railway (€41 for up to 5 people – a bargain for anyone travelling as a small group, but no IC or ICE trains allowed). We transferred easily to Koln and into a hotel run apartment close to the station. The Koln beer is Kolsch, similar to a Pilsner lager and served in tiny glasses. By no means my favourite beer, but we went into the Früh am Dom (which as the name suggests, is close to the cathedral) for a beer or three, and I felt it would be rude not to imbibe. Then it was on the train to Bochum, about an hour’s journey. Before starting I googled for good beer in Bochum. James said look for the work Brauhaus, and I said what about Privatbrauerei, “sounds good”. I am told. An Altes Brauhaus close by was noted as second choice. So on arrival in Bochum, our first destination is the Privatbrauerei Moritz Fiege, just around the corner from the station. It is just that, a brewery – with no functioning beer outlet. So on to the Altes Brauhaus Rietkötter which despite the comments from my compatriots is easily found exactly where the map says it is. Unfortunately the woman there uses the word geschlossen, (closed) and turns us away. 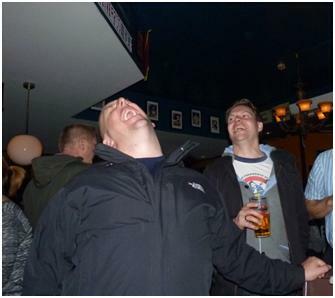 And hence I get my moniker – “The man that cannot organise a piss up in two breweries. Fortunately, on the next corner is the Fiege Stammhaus, which is the primary beer outlet for the brewery we stopped at earlier. This serves us all with half litres of their excellent Schwarzbier, a rich porter like bier served in heavy ceramic pots. I stick to this for the second round, while two of the others go to the Altbier. We also enjoy a choice from the variety of Schnitzels on offer. I had decided not to join the others at VfL Bochum. This was a trip of revisits, and the evening presented the best chance to step away for a few hours and tick off a new ground. 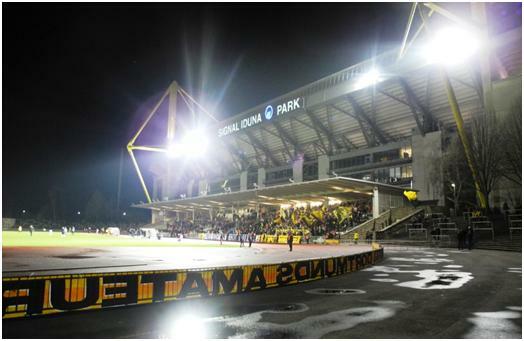 The ground was the Rote Erde, the venue for Borussia Dortmund before the adjacent Westfalenstadion was built. Now used for their reserve team in the third division. Dortmund are now one of only two second teams in the third level of German football, and get an average crowd just over 2000. The other is Stuttgart who have the lowest crowds in a division where the average is over 5000. This game is not against VfB Stuttgart II, but Stuttgart’s other team, Stuttgart Kickers. I rarely tick new grounds for reserve teams – even in this case where they do not share with the first XI, it is well down my priority list. However, my advice to all, is that if you only ever see one reserve game, then make it at the Rote Erde. For a start, you have the historic ground. You see a number of similar examples around Germany, but few in such good conditions. 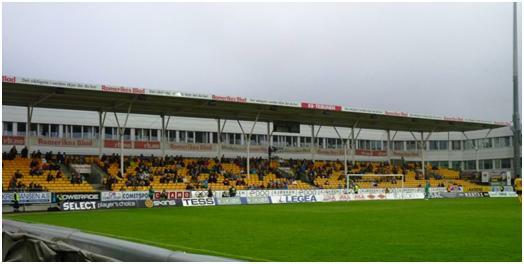 The pitch is surrounded by a track, and all around the track is around 20 steps of concrete terracing, liberally sprinkled with crush barriers, and just a few dividers for the requirements of ground segregation, then you have the Westfahlenstandion (currently under the Signal Iduna name) looming high above the modest seating stand (which goes most of one long side). Incidentally, the name Rote Erde means Red Earth, a reference to the old red mud pitches that used to be common in Germany, especially when the number of games and weather made grass an unsuitable surface. I have only seen one game on this surface, in the suburbs of Hamburg and the Rote Erde is actually Green Grass. But what really makes this one special is a group of around 4-500 hundred home fans. Almost without break during the 90 minutes of play, this group were singing and shouting as if the match was a big game next door. The main difference being that those to the edge of the group (at least) were holding plastic beakers of beer in their hands, which limited their movement in some of the “jumping up and down”, or “clapping” moments. At the front of the group were a pair of drummers keeping the beat, and one “song leader” (there must be a German word for this, and it must have at least 20 letters) who always has his back to play as he organises the orchestra with a megaphone. I took some photos from behind and a distance, but when I tried to catch them from the path at the front of the stand, I was told “no photographs”. 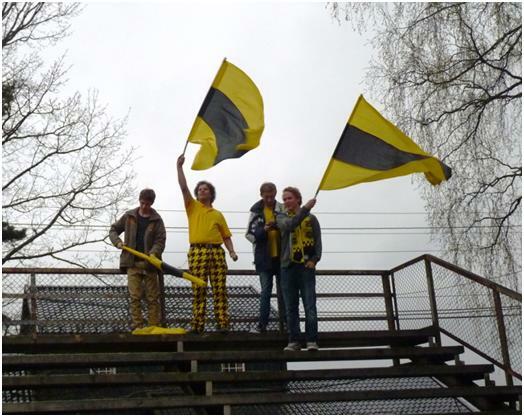 While there were a number of supporters waving (large) generic Dortmund flags, one near the front had what appeared to be a hand painted banner, on which the roman numerals II were heavily imposed over the Borussia badge. Only in the last few minutes of the game did you actually get a sense that the singing group were actually aware of what was happening on the pitch. This was properly just as well, as what happened on the pitch was not particularly good. Stuttgart Kickers probably had the better of the game, with their wide play providing some hope, particularly Fabian Baumgartel – an overlapping full back. But their consistently low crosses always found the solid organisation of the Dortmund centre halves. It appears the home side felt it did not matter their full backs were not good, when the centres were so commanding. It may well have been Baumgartel who got himself fouled with 20 minutes to play just outside the box – it was Vincenzo Marchese (one of three Italians in the Kickers XI) who curled it into the top of the net to give the visitors the lead. This at least livened up the non singing supports who had to this point settled for polite applause, but now could be heard berating the officials’ perceived mistakes and their own players’ actual mistakes. The other notable occurence was the appearance as Kickers substitute of Randy Edwini-Bonsu. This is not a name one forgets quickly, even if it was 4 years, and around 4000 miles distance since I last saw him. In 2010 he came off the bench to score a lake equaliser for Vancouver Whitecaps in the USSF Division Two, and then the next day I saw him start for their “Residency” (read youth/reserves) team at Tacoma in the PDL. Edwini-Bonsu managed the cross that had eluded the players earlier in the evening, getting the ball through to Marco Calamita on the far post. Calamita then managed to miss this gilt edged opportunity to take all the points. From the resultant goal kick, the ball was punted upfield (Dortmund do a lot of punting upfield), and the ball found its way safely to Daniel Wagner, the other goalkeeper. He somehow messed up not one, but two chances to hold onto the ball before Dortmund sub Thiele took the opportunity to stretch just enough to connect with the ball and put it into the net. Cue for more celebrations than normally seen for the winner at a cup final. Even the singers momentarily dropped their beat to acclaim the brilliance of the event. 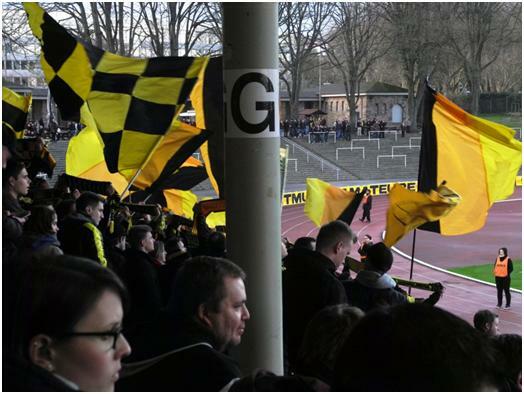 There was a sign behind the goal Borussia Dortmund Amateurs gegen spieltagsuberschneidungen. This is something about overlapping matchdays – but what the campaign is about I do not know? Supporters in Germany have always been against changing kick off times away from Saturday afternoon (even though this is not used much by the 2.Bundesliga). I wondered if Dortmund’s second team were against any move to make them play at the same time as the first XI, (clearly not possible if both are at home the same day). Perhaps also this is an old poster – it is the only reference I saw to the team as Amateur. The team list called them Borussia Dortmund II, while the website and match ticket uses U23 as the designation. About half the team are listed in the First team squad list on soccerway, but most of those have not actually played a Bundesliga game. Back to the Stammhaus where I had only a short wait before meeting the others, whose transport back from the local stadium had been made easy by a protest against a home team described as absolutely abject by our neutral viewers. This time it was Altbier all around, followed by two of our party, (no names, but not me), deciding they wanted to keep the mugs. 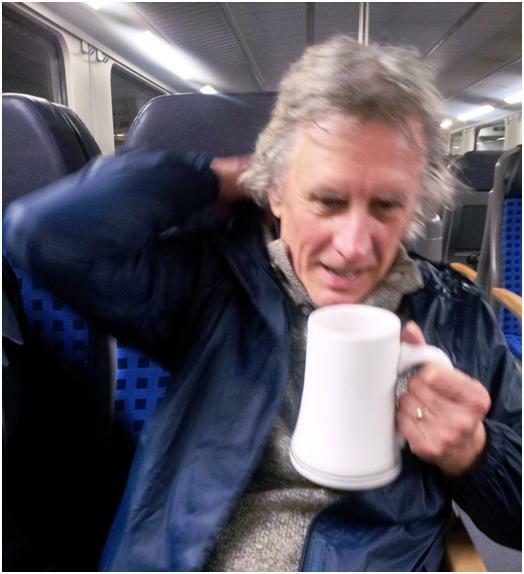 From what I understand, the police are now looking for this man, last seen on a regional train between Bochum and Koln. The next morning, the plan was to have a fry up and then take a drink in the old town before getting the tram out to the local venue to see 1. FC Koln. In the end, by the time we had all awoken and the breakfast had been dealt with, we decided to cut things short and head straight to the ground. The Rheinenergie Stadion (current name) was just plain Mungersdorfer when I last went and it has been completely rebuilt as a functional stadium. There is nothing at all wrong with this stadium, but I doubt if it ever troubled the architectural awards. There are a number of other sporting facilities around, I saw a sign pointing to the American Football ground, and there is a large grassed expanse between the tram stops and the stadium with a number of outlets each side of the main path. We soon queued up and obtained the first Kolsh of the day, (and the second). Inside the stadium one has to buy a stored fan card to buy more food and drinks, but Brian did this, and got enough added for more beer, which of course we drank by our seats in the stadium. The matchday programme was in two parts, a large A4 magazine which covered two games, and a simple A5 sheet which unfolded to A3 and included the line ups. Both were free of charge. Our seats were at the top behind a goal. Brian had bought these in advance on-line with a face value of €23.50. The views from up here were very good, but the game was not. The visitors VfR Aalen had come to park the metaphoric bus, and despite being league leaders, Koln did not have the guile to break down formation that while listed as 4-3-2-1, actually reduced to 6-3-1 whenever the slightest pressure was applied. At the end of the game, it was straight back to the hauptbahnhof for a train to Mönchengladbach. Two themes that were to be common to the trip were in evidence. Trams would appear by magic within seconds of us arriving at the stop, (or were already there and waiting), but as I had found out on previous trips, most trains run around 5-10 minutes late. The first train of this short trip was no exception, but as we had a 19 minute connection this did not make any difference when boarding a rare on-time train at Neuss. On arriving in Mönchengladbach, we spurned the buses taking everyone directly to the ground and instead headed town wards. We found an uninspiring pedestrian street with a few vendors in a side street. We settled into an almost empty bar for a couple of glasses of Altbier, which did go down pretty well. We returned to the station and picked up the shuttle to the ground in good time. The ground is at Northpark and is around a 20 minute bus ride from the station. There is a business park as well as the football ground, and it badly needs a better transport link than the shuttle buses. The ground is another functional venue with unadorned concrete outside. 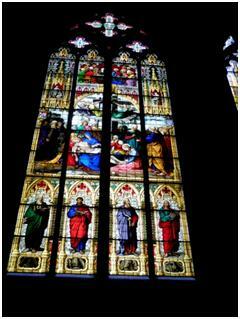 As with Koln, inside every site line is perfect. Despite the attendance being some 6000 more than the earlier game, the chanting does not quite seem as passionate, or as well choreographed as at Koln. We were again high up behind the goal, and a full pitch length from the standing section. One thing that probably made a difference was the number of corporate seats, filling most of one side. I still get the feeling that the Germans understand the dynamic of the crowd structure better than we do in Britain. Those in the corporate seats are there to be entertained, and the noise emanating from the singing sections at the ends of the ground are part of the entertainment. In the first half of the game, Borussia tore into the Hertha defence, a direct style (both teams lined up 4-4-2) which paid dividends. The 3-0 lead at half time was no more than they deserved, but of course meant the game was over as a contest. Hertha had played part in the entertainment until they went behind and then lost confidence badly. The second period was very different. Hertha played a game of “what we have, we hold”, holding possession and playing the ball from side to side along the back four without ever making a threatening move. In short, playing for a 3-0 defeat. Mönchengladbach took this in their stride. If Hertha wanted to lose 3-0, then their wish could be granted and hence they did not work particularly hard to break down the now stubborn defence. It was at the end of the game that we really saw the problem with 53,000 with limited transport options. I had seen on my previous trip that despite the close proximity to motorways, it takes a long time to drive away from the park. This does not appear to have been changed. If this is bad and slow, queuing for the shuttle buses back to the station was worse. It took us over an hour to get onto the bus, with the crowd pushing and shoving to get onto the buses. Stewarding was minimal, and the risk of injury in the crush clear for all to see. As Youngy said when we got back on the train – if the people of Mönchengladbach put themselves through this 17 times a season, there cannot be many alternative entertainments available in the town. We just made the hourly direct train to Koln, 90 minutes after the game finished, and returned to our rooms with a selection from a late night off-licence/grocer we passed just after exiting the station. (I was incorrect when I said on approaching the first one, that there was another closer to the hotel – there were at least two). Sunday starts quietly, we have a train journey of over two and a half hours to Bielefeld, and do not start on the beer until we had arrived inside the stadium. I had not realised how much the ground had changed since my previous visit. It is yet another perfectly aligned modern stadium. It is sensibly sized, so the 11000 crowd does not get lost in space, but this means it can only hold 5000 more than the 22,512 which was the sell out crowd figure for every game in their first top level season, (I was there 16 years ago for that). It is going to be a while before this becomes an issue though, and this season the mission for Arminia is to avoid a return to the Third division, rather than plot a return to the top. It is a mission that they seem ill-equipped to succeed in. Energie Cottbus came to the ground as the bottom team in the division, but did not show us how they got to that position. Instead they deservedly won the game, the excellent Boubacar Sanogo giving them a first half lead. 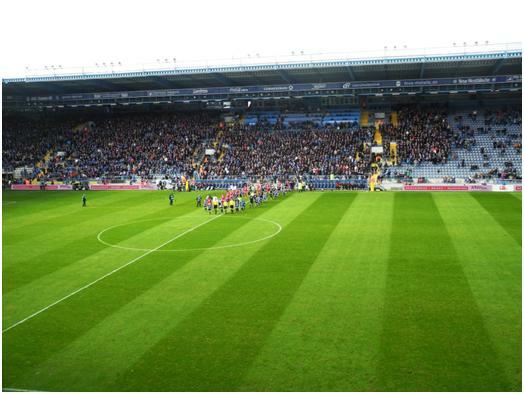 Despite Jan Fiesser’s second yellow card, just before the hour mark reducing the home side to ten men, Bielefeld clutched at the possibility of a point with a leveller ten minutes from time. 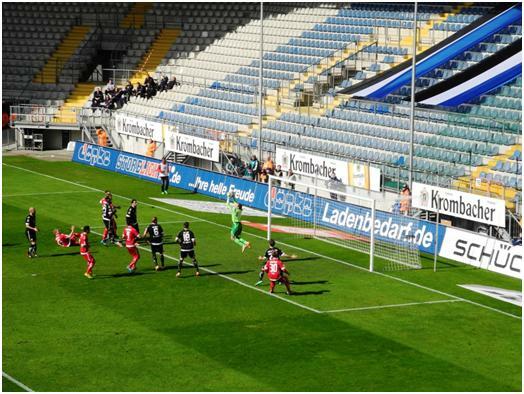 However, a comic own goal put Cottbus back ahead. The goalkeeper made a save, which bounced off the back of the centre half (Salgar) and trickled slowly into the goal. Sanogo then tied things up with another goal in injury time. The matchday programme at Bielefeld is entitled halbvier, this is a reference to the traditional Saturday afternoon kick off time for Bundesliga games (3.30). It is wishful thinking, as in the second and third divisions, the 3.30 kick-off is never used these days, with most matches completed before the top division games of the day take place. Our 1.30 kick off at Bielefeld meant that we could travel back to Koln, and take a place in a sports bar in good time to catch the big event of the day, El Classico, Real Madrid v Barcelona. The sports bar is American themed, but with German beer. You cannot get better than that. The bar was standing room only for the game, so we had done well to turn up while tables were still available, get a good steak and more beer than should be mentioned. After all, apart from the lagers drunk at Arminia, it had been a dry day to this point. 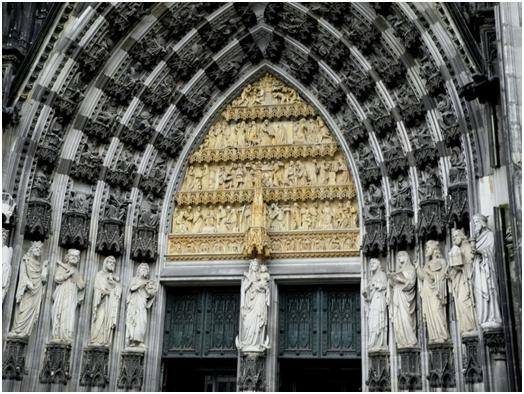 Culture was saved until the last morning, when we finally visited the Dom, Cologne cathedral which dominates to walk between hotel and station. I have been in before, but it is many years since my last visit, I have been in and out of the station many times since. My train from Fredericia dumped me at Copenhagen Airport at 3 in the morning, giving me an uncomfortable four hours before a flight took me onwards to Oslo. This was the simpler way of travelling. I could have made the journey over a longer period by train and still seen the evening game. I arrived in Oslo to find it grey, dank and damp, but fortunately my hotel was unphased by my early arrival time and found a room for me straight away. As the weather was not in the mood for improving, I did not take in much of the locality, just a little chance to appreciate that I was close to what appeared to be a small town centre, that most of the shops were closed (it being a public holiday) and that while there were plenty of restaurants around, the prices even for the simplest meal were considerable. I was also surprised to see a number of beggars. Norway is famed as a rich country with a wide reaching welfare state, but clearly there are people who the system does not support. 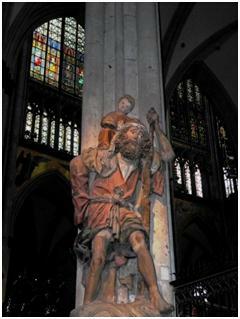 Not surprisingly the beggars did not appear to be of Norwegian stock, Norway has some of the shortest working weeks in Europe, and also requires a large number of expatriates to fill both the most skilled and the least skilled of positions. The Oslo portion of my trip is not part of the standard football trip. The day after my arrival, I was joined by six Cheltenham fans from Cheltenham, five Cheltenham fans from Oslo, and one from Denmark! I think naming names is in order, so from Cheltenham we had Jim Haggin, Greg Parry, Twinners, Keatsie, Blondie and the Queen, Norwegians were Andre, Andreas (Machinen), Trygve, Even (a place on Earth), and Ole,while the Danish Yes Man also goes by the name of Klaus. Like me, Klaus had to fly in from Denmark – he works in Oslo, but had made the excursion to Copenhagen to see his home town team, Esjberg winning the Danish Cup. I had one piece of business to conclude before becoming one of the gang – Lillestrøm SK in the top division of the Norwegian League. The Top division tends to be known under its sponsors name as Tippeligaen, but would otherwise be referred to as the Premier or Elite Series, Division One (also a National and Professional Division) and Division Two (a semi-professional league of four groups, which I shall get to later). The highest division known simply by division number is Division 3, which has 12 regional sections. I did suggest to the group we could go to a game at this level on the Friday evening, but they wisely decided an evening of beer and pizza was more enticing, and sensibly persuaded me to join in. Anyway, to Lillestrøm, which means a 10-15 ride from the centre of Oslo, the station is generally a stop on the way to and from the airport, and the train actually passes the stadium, although it is difficult to spot, clad in houses and offices and with the floodlight pylons retracted between games. Although Lillestrøm exists and a municipality outside the capital, it is effectively a dormitory town for the city, and there is very little to see other than apartment buildings. 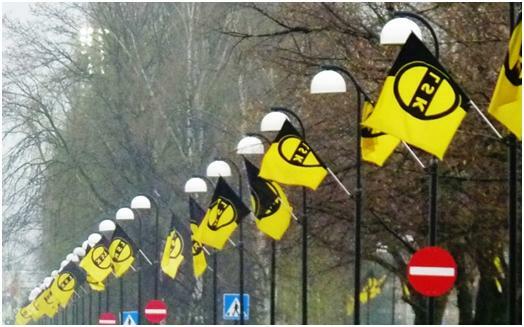 The football club is one way in which the town can demonstrate its own identity, and as I approached the ground, I was greeted by an avenue of yellow and black flags – on both town flagpoles, and also attached to the apartment buildings. Many of these commemorate a Norwegian Cup win in 2007, the last trophy won by Lillestrøm – they have been national champions on 5 occasions, but the most recent is back in 1989. The 2007 win was also their fifth cup win. The club’s high point came in the seventies and eighties when they won each trophy four times, including the double in 1977. 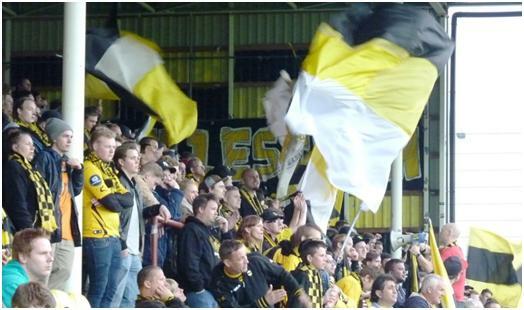 In common generally with Norwegian teams, Lillestrøm’s record in European competition is uninspiring, of their 16 attempts, 10 have ended at the first hurdle, most embarrassingly in the 2007-8 UEFA Cup when they were beaten by FC Kaerjeng on Luxembourg. In 2000, Lillestrøm beat both Glentoran and Dynamo Moscow before losing the Spanish sides Alaves – their best run. The southern end of the East Stand is the “singers section”. I noticed at the end that one person collected the flags to return to a storage cupboard on site. The visitors were Sogndal, and both sides lined up in classic 4-4-2 formation. Lillestrøm started the brightest, bringing their Ivorian winger, Moryke Fofana into the play whenever they could. Fofana turned out to one of those players that flatters but cannot deceive, and seeing as he was effectively marked out, he was replaced at half time. Sogndal had plenty of pace, and basically tried to get the ball up as quickly as possible, and hopefully win corners or free kicks so as they could add the height of their centre halfs. This was how they went ahead in the 23rd minute, winning a corner which was crossed in from the right and met by the head of Gustav Valsvik. This sent the ball across the face of the goal, and with Lillestrøm struggling to find a way to clear it, Hannu Patronen, (the other centre half) got his foot in for 1-0. 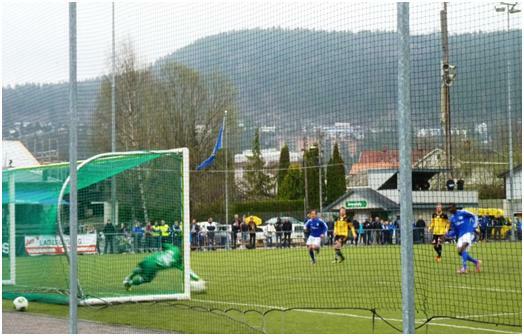 Once they were ahead, Sogndal seemed to assert an authority. 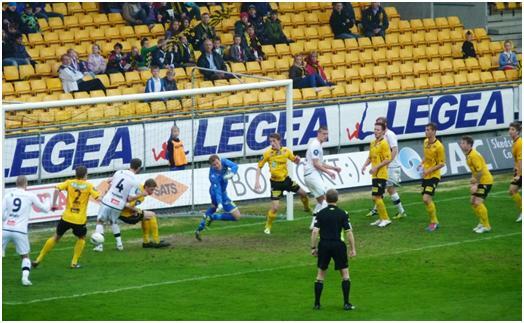 A second goal was added and again it was a Valsvik header, this time all that a free kick needed to reach the target. The frustration of home fans was obvious, and another failure by Fofana just before the break caused someone not far away from me in the seats to scream (in English), “Just F***ing cross the Ball!”. 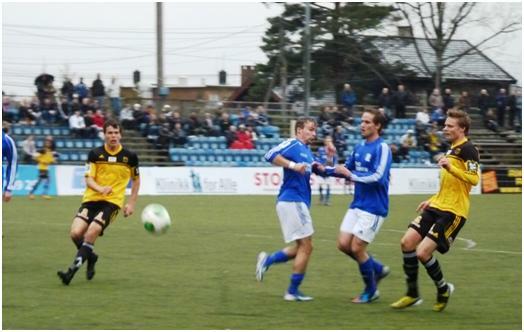 First goal – Valsvik on the right hand post has headed the ball on. How Lillestrøm allowed the ball to get from here to be in front of Patronen (4) is beyond me, but I’m guessing Østil (2) will not enjoy watching the replay. Lillestrøm needed a change, so Fofana was taken off at half time, and it was his replacement, Ohi Omoijuanfo that scored their first goal. The real change however had been to start playing the ball down the other wing, with full back Scheel overlapping or playing ahead of his winger and playing several dangerous crosses. Lillestrøm levelled with 16 minutes to play, when Gulbrandsen managed to produce an unimpressive dive, which somehow convinced the referee. Petter Moen scoring from the spot – but Lillestrøm were never convincing winners of the point, and could not push their advantage when Patronen received his second booking and meant Sogndal played the final ten minutes with just ten men. The seating behind the goal, showing the office buildings that hide the stadium. On Friday morning, most of the roaming Cheltenham support were arriving in town, so I quietly awaited the arrival. All storms after all need a lull beforehand. When they were leaving the airport, I received a text to give time of arrival at the station, and that two of our Norwegian brethren were to be there as well. I naturally made my way to join at the meeting point. We quickly found a pub around the corner from the station, and while most were ordering standard lagers, and the queen was discovering her white wine and soda would have to be without soda, I noticed the row of bottles from a local brewery, which seemed to be a complete compendium of beer styles. I pointed out the Brunn, but one of my hosts decided instead to go to the top of the range – so I got a strong dark almost treacle like beer, with significant quantities of sediment swirling around the glass. The general price of a beer in Oslo is now around 60kr, which with an exchange rate of about 8.7, works out around £6.90 – my beer was twice that. This was the only beer I took at this strength – it was not exactly a session beer after all, and all the rest of my beers cost less than £10 each. One of the Norwegians paid for this first round with a simple swipe of his credit card, we all came to do the same with our own rounds. All of the Norwegians we met were working, but as far as I know none had particularly high paying jobs – but still they can buy rounds of beer costing over £50 without comment. It is a country of high beer prices (indeed high prices for everything), and high taxation, but of high wages that cover this. In other words, if you use indices like the time the average man has to work to pay for a “Big Mac”, the average Norwegian is actually well placed compared to most of Europe – but the actual price of the burger is higher in Oslo. For the moment, the continuing oil glut (even if peak production has passed) and the size of the country’s sovereign wealth fund means the exchange rates are not going to change. The question of how Norway is to transition back to the mainstream when oil revenues reduce appears to be left on the back burner. Anyway, I had the chance to go to a match at Norwegian fourth level on Friday night, but no one else around was interested and it did not take much to persuade me I would be better heading to a Norwegian flat to drink beer and eat Pizza. The flat we went to belonged to one of the Norwegian Robins, but not one that was joining us, as he was out of town. The flat contained a most monumental sound system controlled from a PC, but not one of us could manage to turn it on, and the music ended up being supplied from a mobile phone connected to speakers found in another room. Next, we drank beer, and some scotch and ate some pizza. Meanwhile, the final member of the party, Twinners was sending text messages in the report on his progress through Heathrow. Eventually, we headed back to town to meet Twinners as he arrived, and (what a surprise), continuing drinking there. I can no longer recall where I was drinking, but my main choice now was a dark local beer supplied on draft that appears to be available in most bars in Oslo. By the end of the evening, the Danish Yes Man was the last of the local contingent and he suggested moving on to a strip bar. Most of us declined this, and on the basis of what happens in Oslo, stay in Oslo, I will not say who actually went along (it wasn’t me), anyway, most of their friends have already heard of the 3200 Kr (over £350) for a “lesbian lap dance duo”. I was impressed that one of our men at the club had the presence of mind to insist that one of the strippers was blond. The one place in Oslo where blonds appear to be in short supply would be lap dancing clubs, as none of the dancers are likely to be locally born and bred. Not wanting to get back to alcohol in a hurry, the second morning was spent on the open top bus tour. The bus is not truly open, as it has a canvas cover – which in turn creates a wind tunnel of the whole upper deck. The tour guide insists that Oslo is one of the world’s biggest cities, but this is done just by appropriating the surrounding mountains and trees and call them Oslo. It is a small and generally compact place, with a shortage of things for a bus tour to comment on. So we would head down a road and be told that on the right, you can see the folk museum, and then minutes later, on the left you can see the folk museum. Then a quick drink was taken, along with a snack lunch before we all embarked on the bus to Kjelsas. I did not take lunch with the hope of finding food at the football. Norwegian football has two national, fully professional divisions, followed by semi-professional leagues with four groups in Division Two, (as the third level is called), and 12 groups in Division Three. The match I could have gone to on Friday night was in Division Three, but Kjelsas was in division two. The trip involved a 25 minute bus ride out into the suburbs, (it’s a tram route, but this was a Tram replacement bus). The stadium is a little ramshackle, with a club house selling coffee, waffles and the local non speciality of hot dog sausages in some type of pancake. 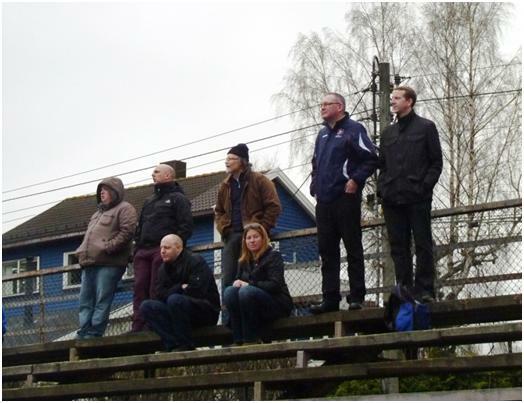 Admission was 100 Kr, and attracted 156 to watch. A small programme, consisting of one piece of A4 folded over as an A5 programme was free. The far side to the entrance consisted of plentiful wooden bench seating – some with plastic seats attached, but the only cover was provided by a few awnings over a veranda to the side of the clubhouse, and frankly a little more would have been nice in the cold drizzle of the afternoon. To the sides of the pitch were piles of snow some covered by sweepings from the artificial pitch, which was showing signs of wear and poor maintenance, (as is common at this level, the pitch is a 3G artificial surface). The game itself was not up to match with two goals near the half way mark to liven things up just a little. We were impressed with the small group of visiting fans, who kept up a chant sounding like “Combien Baerum” throughout. It is a pity they only know one song. We are not certain of the word used, but we suspect it was Norwegian for “Come on”, and not French for “How Much”. With the English Cup final now hidden away late into the Saturday afternoon, we missed little of the game in heading back to the town and finding our way back into the sports bar near the hotel. It was now packed out, showing an embarrassing lack of taste on behalf of many Norwegians, sporting the light blue shirts of Manchester City. Wigan shirts were not very much in vogue. The bar also held magazines including those for the association of English supporters clubs in Norway. While it was not surprising to find the biggest supported clubs were the successful Premier League clubs, Cheltenham actually have more Norwegian support than some of the Premier clubs, and indeed Reading and Southampton could not muster any support at all. For our evening meal, we were given a choice of Reindeer or Whale, the two meats Norway is well known for. I went for the more environmentally favoured Reindeer, (Heidi said she could not eat Rudolf, but there was no sign of my meat having ever had a red nose). I did get a taste of the whale steak, and I must say it was quite delicious. Between the English and those Norwegians that had joined us again, there were 11 for dinner, and some amusement all around when we discovered a meal for 11 came to exactly 3200 Kr. Yes, in Oslo, 11 people can be fed, even on Whale steak for the cost of a couple of lap dancers! It is actually more difficult to judge the team you are attached to, than those at a distance. By the end of the season, I will have seen something like 170 games, of which 37 (or if I’m lucky 38) will involve Cheltenham Town. At home, I have missed only a couple of midweek matches, while away I see about half the games. So, looking at the season not quite in retrospect. What sort of season has it been? I have deliberately decided to write this before the final games, with the play off situation still in the balance. In many people’s minds these games are going to be the whole of the season, basically we are a success if we win promotion, and a failure if we do not. These are false arguments, our achievement this season is coming fifth in the league, aligned with a run to the third round of the FA Cup. The preliminary suggestions (as the final figures are not out until next spring) is that the books will again balance, and some surplus to remove historical debt from the club. This looks good for the future of the club, but many of the supporters do not care. Many would have us spending money that is not there in a bid to bring greater success to the club, pointing perhaps to Bradford City who publicly proclaimed they would have made a £600K loss for the season if it had not been for reaching the League Cup final. The downside of this is shown at Aldershot Town, who went into Administration within days of leaving the league. This is just 21 years since their predecessor failed to complete a Football League season, causing a new club to be formed with the “added” Town on the name. Its also worth noting that another former opponent of ours, Farnborough FC are also in trouble, and in their case after a change just six years ago which resulted in Farnborough coming out of the ashes of Farnborough Town. It is all too easy to joke that they will just restart with the Town suffix heading north to Farnborough from Aldershot again. Anyway, let’s get back to the season where most people care about it. On the field. In simple terms, Cheltenham finished 5th out of 24 teams and entered the play offs. In straight economic terms, budgets follow average crowd figures. Cheltenham are 15th in the average attendances for the division, with 3253 seeing an average game at Cheltenham. If analysed closer, this figure is rather on the high side – the average gets boosted by a small number of good crowds, while rather too often the attendances sit below the 3000 mark. Still, however we show the figures, Cheltenham are in some way over achieving, as we have done for the majority of the seasons in our league career. But yes, I digress again. Like a good politician I am shying away from the answer to the question, how did this team perform? I would have to say that on the whole, the season has been one of frustration. We get to see glimpses of what these players can achieve, and then they fail to achieve it. I do not think Cheltenham has ever had a more capable squad of players, but we seem incapable of proving this to be true. In the past, Cheltenham’s league squads have been based on a few players with genuine pedigree, bolstered by a number who are not even journeymen pro, but instead have a short professional career, dropping out of the football league as soon as they are released. If I was asked to show an example of this, I would mention Andy Gallinagh – who made something like 130 appearance in our colours, more than half of them in League-1. No insult meant, but Gallinagh is not a great defender, and when he looks back on his league career, he will probably see he did well to play that number of games, but the scouts were never queuing up to watch him, with lucrative promises of a career at a higher level. The current squad does not have much in the way of Andy Gallinagh about it, our current players can all play the game, and do not have to rely on pure commitment and energy to hide the gaps in the capabilities, and they know it. Quite a few of our players are being watched by others in this division and in League-1. The majority would pick up another League club if released this summer. Now this is League-2. A footballer gets stuck in league-2 because he cannot perform to the highest level for more than 50 games a season, but suffers from a lack of consistency, and does not have as much ability as a higher level player. We now have, including loan players, about 18 of these typical league-2 players. You can often look at the team, and at the bench and see little or no difference in the quality. I mean how does Yates choose between Jason Taylor or Darren Carter? Both can do the job, and on a good day will do it – but both are capable of anonymous games where they hardly see the ball. Alright then, the season in segments. We started well with seven points from 3 games, but then stumbled with the Accrington and Southend home games. What we did not know at the time was these would be our only home league defeats of the season. We then had our best run – the next 11 League game saw us lose only once (at Bradford), but we came back done suddenly with the heavy defeats at Rotherham and Chesterfield. This set us up for the two nervy FA Cup encounters with Hereford, which naturally we made a meal of. We then had some poor results in the run up to the Everton game, with only the Boxing day encounter with Wycombe brightening December. Unfortunately we lost the Bristol Rovers game to the weather, and it was only re-arranged after John Ward had come in to refloat the Gashead’s ship. The winter passed with a lot of draws and an embarrassingly poor defeat at Dagenham. There is no doubt that if the games in January and February were to be typical of the season, they we would not be thinking of promotion, direct or by the play offs. To me, this felt like a reality check – turning around the year in a promotion position just did not feel right, we did not appear to look like a promotion team, and we dropped down to the level this team should expect. I think it turned back in our favour at Fleetwood, where we won a good point away to a team still in contention. Our next five home games were all won, although our form on the road was far from inspiring. I would say we were up to our average in this period. This certainly frustrates many of those fans writing on the message board, as this average kept on falling just short of that needed to get us into an automatic promotion place. In the end, that is where we finished, just short of an automatic promotion place. I will not be disappointed if we miss out on promotion again. I do not feel we are really good enough to go up. Yates’ should feel it though as to a great extent it is his responsibility. He has been responsible for the signings, the contracts, for the balance of the team. He has been responsible for the constant chopping and changing between 4-2-3-1 and 4-4-2, for the swapping in and out of equally culpable midfielders. I honestly think he needs to know exactly what plan A is. We should not make four or five changes to the team, and change the formation every time we lose a game. Instead we should have a plan A in formation and game plan and stick to it. To some extent this has been forced on us in the past, when we have not had too many options on the bench, whereas we now have the scope to change the midfield, and allow the forwards to come in and out of favour, and this has been overused. Will others agree with me? Certainly the messages on the forum suggest a season that was somewhat worse than I have described. A place in the play offs should only be a disappointment if one felt the team was head and shoulders better than the rest, and should have easily won automatic promotion. Gillingham were clearly the best side in the division this season, but even they were not head and shoulders above the rest. I would be happy to congratulate them if it was not for their manager, who not only was an embarrassment to himself and the club during his time here, but still appears in the media to be on a trip of self-aggrandisement, and not capable of giving credit to his players, or to the budget his chairman has kindly provided. For just about any side short of Gillingham, the league was a close run affair, with even the eventually relegated sides capable of stealing points from those at the top. I always find it strange that people automatically claim the closeness of the division means it is lacking in quality, but such closeness can be achieved by the lower sides improving, as much as by the better sides failing. I do not think our team has dropped its playing quality from last season, and I believe the game played now is technically much better than it was during our first league seasons, (there is much less hoofball all around and far more reliance on passing). I think the efforts of the Football League to try and bring some order into the financial mess of the football league is beginning the bear fruit, and this is reducing the ability for teams to buy success on borrowed money, (it has not yet ended the excesses and we still need a stronger license based system). A conclusion? I would say we have done as well as should have been expected, but we are a frustrating side to watch because just occasionally we reach heights, and then struggle to even glimpse where they have come from. Almost every player in our squad has been guilty of flattering to deceive in this way. A second run to the play offs has not exactly bought the fans out of the woodwork, and even if we reach Wembley, I doubt if it will be in front of record crowds. Still, overall and without waiting to find out how it finishes, I think this has been a good season. Todays game may be a celebration of the players that won Cheltenham Town a place in the league 10 years ago. But that was not the end of any story. As a club we have managed not only to survive for a decade as a league member, but to spend four of those seasons above the lowest tier of league football. This achievement must never be under-estimated  after our ascension, the next three Conference Champions failed to establish themselves and are now back in the Football Conference. Ten years of the Football League adds up to 460 matches, we have played six play-off games, and then adding the FA Cup, League Cup, League (LDV or JP) Trophy and a Conference Championship game in our first season; we have a total of 533 in the period. Only two players have played more than half these games, with our league appearance record belonging to Jamie Victory  Jamie has played 473 times for Cheltenham and scored 47 goals, a great record for a full back. Jamie was ever present in our first league season, missed most of the following season through injury, but then came back and played most games for the next four seasons and retiring in 2007. Second on the list is the only player who has had a ten year tenancy at the club, arriving in the summer of 1999, and leaving this summer. After three years, this players was noted mainly for his patience, having played just one LDV game (we lost 2-0), and coming off the bench twice in the league. It was only near the end of the relegation season that Shane Higgs was given his chance, and he took it with both hands, quickly becoming our first choice keeper, a position only rescinded when his ambition drove him to pastures new, spending the end of last season on loan at Wolves, and who knows where next? John Finnigan arrived from Lincoln in March 2002. He came in mainly to cover for injury, but has stayed ever since. He has played 252 times for us, all but 14 starting. Before arriving at Whaddon Road, his record was as an uncompromising midfielder, with only 3 goals in over 100 appearances for Lincoln. Curiously the last was at Whaddon Road over two years before becoming a Cheltenham player. Finners scored on his debut for the Robins, but his third goal for the club  at the Millennium stadium in the play off final secured his status. So far he has scored 27 times for us. Mark Yates and Michael Duff were both with the club on promotion, and added over 200 appearances in staying with the club for a further five years. Yates ended on 240 appearances (22 goals) while Duff made 372 (16 goals). Yates is now managing Kidderminster, while Michael Duff is still with Burnley, hopefully about to make a Premier League debut. Grant McCann arrived at Cheltenham no less than three times, on loan in 2000 and again in 2002, before finally signing for £50K in 2003. His third stay at the club was for three and a half years, while he picked up 33 appearances in his early loan spell (with three goals securing him in the hearts of the supporters). In the end, he played 222 time for the club, and scored 46 times. McCann marked a change for Cheltenham  a player we paid for, and then sold as a profit, we even picked up a small bonus when he moved on from Barnsley to Scunthorpe. If there is a surprise among those who have made 200 starts for Cheltenham in the league, then it is Jerry Gill. Already nearing 34 years of age when arriving from Northampton, Jerry played in 90% of the games in four complete seasons with the club. He left last autumn to take up a coaching post at Forest Green. Also making 200 appearances since we joined the league are David Bird (whose next appearance will be his 200th start, but has also added 47 sub appearances, and eight goals), Shane Duff (three short of 200 starts, but with 11 sub appearance and three goals), Martin Devaney and Damian Spencer. Devaney like Higgs, was a new signing when we joined the league. He stayed for six seasons, making 173 starts, 55 appearances off the bench and scoring 42 goals. Big Damian Spencer scored 39, even though nearly half (128) of his 263 appearances were from the bench. Finally, a quick mention for Steve Book, who if I have my sums right made 199 of his 319 appearances since we joined the league. Grant McCann is our top goal scorer for the last ten years, and Devaney weighs in third on the list. Second is another big man, Julian Alsop with 44 from 117 starts, and 22 bench appearances. Damian Spencer is fourth top scorer, while two others have more than 30 since we joined the league. Kayode Odejayi scored 34 from 119 starts, and 55 sub appearances before being sold to Barnsley, while even injuries do not disguise that Gillespie scored 33 goals in only 69 starts (and another 26 appearances from the bench). Like McCann, Gillespie was twice on loan from Bristol City before signing on. He then played for 18 months before switching to Colchester. Since leaving the club, he has been hampered by injury, but still scores when he plays. At the other end of the scale is what I call the nowhere men. Official statistics only show those players who actually appear, either by starting or as a substitute, but with at least two players staying on the bench throughout every game, (increasing to four, as we will be allowed to name seven subs this season, but can still only play three), there are always a few that make it to the bench, but never to the field. One web site, www.soccerbase.com, records these players and includes them on the seasonal squad statistics, with a zero in every column. From my counting, I believe there have been ten of these players since we have joined the league. It says something (but who is sure what), that no less than three of these were youngsters selected by Martin Allen last season in Dean Maynard, Lewis Fathers and Cathal Tosh. Will Puddy would also have been on the list if he had not made his debut in the last game of the season  Puddy had also been on the bench without appearing in each of the previous three seasons. The first of the nowhere men was Nicky Marker, who at the height of his career spent 5 years at Premier League Blackburn Rovers. Blackburn had signed him from Plymouth, and he then went to Sheffield United before coming to Whaddon Road. Marker only spent a month at Cheltenham, and went on to Tiverton. Most recently he has been at Plymouth club Tamarside, where he combines youth coaching and being chairman. The majority of the nowhere men are youngsters who did not quite make the grade, and many appear in local non-League sides later. This is true of both Lee Burby and Stuart Mitchinson, who non-appearances were in 2000-1. Both have since been sighted at Slimbridge. Burby is now a personal fitness trainer in Gloucester. Luke Buttery, who made the bench in 2003-4 season, was at Bishops Cleeve last season, while we also signed goalkeeper Craig Humphries that season, and let him only the bench at least once. He was named players player of the year at Malvern Town last season. The last two, Sam Foley and Shane Paul played in 2006-7. A lot of those who watch reserve games rated Foley quite highly, and were surprised he was released last year; he went onto Kidderminster, and in fact was in the nowhere category last season, getting onto the bench, but still to make his first appearance. Shane Paul was signed from Scunthorpe, and spent six months without playing for us. He went on to Halesowen, but has not played since breaking his leg in March last year. I have based this report mainly on records at www.soccerbase.com, and my summary file is attached (Chelt League Appearance). I have since been given Phil Rucks stats file, which is also attached (players) and can be used for comparison. A third set of statistics, on paper, and supplied by club secretary Paul Godfrey is available. Unlike the two attached files, this official record includes the non-League appearances of those that played before 1999. I can make a copy for anyone who wants. You are currently browsing the archives for the Cheltenham category.